"Love A Soft Person,” The Importance Of Having A Gentle Soul. “Love A Soft Person,” The Importance Of Having A Gentle Soul. 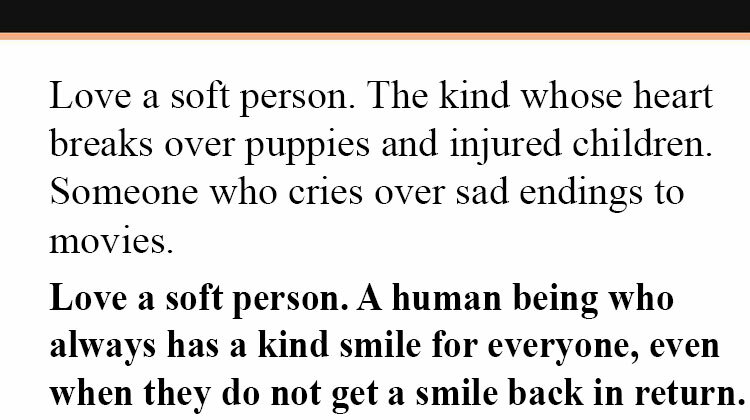 Be a soft person. Be a cushion in a world full of rocks and hard places. Be a gentle soul where everyone else is jaded. Be that person. Because people like that are rarer and more precious than the rarest of jewels in this world. Share these beautiful words today.